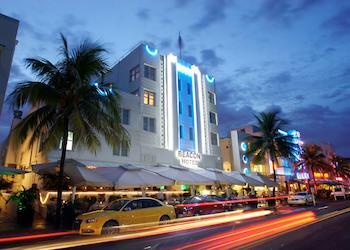 Our city is home to the Miami Art Deco District, listed in the National Register of Historic Places, this is where the largest concentration of Art Deco architecture in the world is found. A stay in one of these gems is quite a treat, specially to architecture and design aficionados. Keep in mind that art deco buildings date back to the 1930's and 1940's and tend to be smaller properties. Spaciousness is not one of the main qualities of these historical buildings. For the most part, they have all been refurbished to comfortable and more than suitable standards with some bordering on the ultra-luxurious. 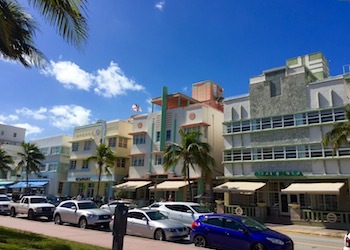 South Beach is almost synonimous with Art Deco Chic and this is where we find many top finds, but there are also some great options in Mid-Beach and further north in Surfside where you also encounter many examples of the newer MiMo (Miami Modern) style. 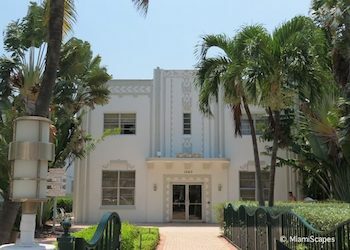 Also worth a stop to better appreciate these gems is the Art Deco Welcome Center on Ocean Drive and 10th Street in the heart of the Art Deco District, which is within walking distance of most of our top picks. And be sure to follow our guide and take a stroll through the District, where you will encounter all of the listed hotels here and many more offering some fantastic architecture in many different styles. Please be aware of the many extra fees you may encounter and check what is included in your quoted rate. Most hotels charge a "Resort Fee" which can run from $20 - $40 per day extra and cover things like beach chairs and umbrellas (yes, seriously, whether you use them or not). Parking and valet services can tack on an extra $35-$50 per day. This 3-story historical property built in 1939 featuring an exquisite Art Deco exterior façade was once the home of South Beach Studios where the likes of Bob Marley, Jay Z, Aerosmith, U2, and Pharrell Williams recorded some of their most prominent works. 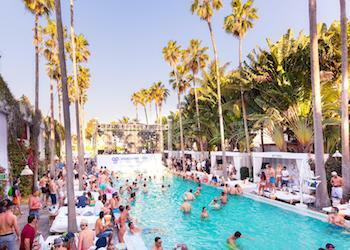 Located on Collins Avenue just two blocks from Ocean Drive and the party scene and five-minute walk from the beach. State-of-the-art amenities including iHome play center, Ving Card locks, Nespresso machine and 55 inch 4K TV with Direct TV and Netflix included. The Marlin is home to Osteria del Teatro, one of Miami's most iconic Italian restaurants. Washington Park Hotel is actually a collection of four landmarked Art Deco hotels occupying one city block. 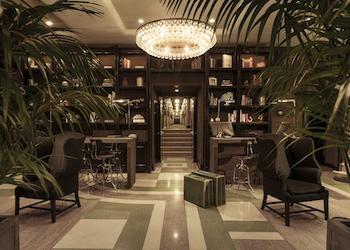 Recently renovated, the lobby exterior has been restored to its 1943 glory. The interior is adorned with warm woods, a light and airy palette of off-tone neutrals, whites, grays, with splashes of color in art and accessories. With an acre of gardens and a retro pool, the vibe here is relaxed. 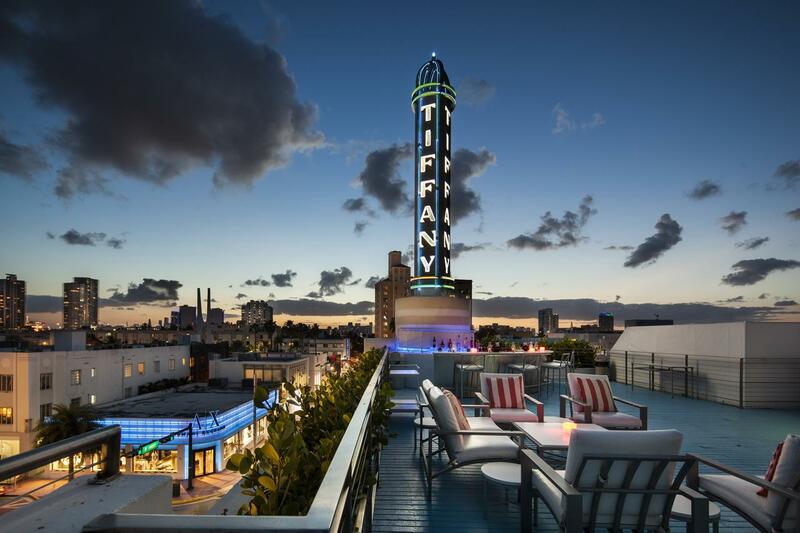 This hotel enjoys a prime location two blocks from the beach and in the heart of the Art Deco District, a short walk to Ocean Drive, Lincoln Road Mall and Espanola Way. 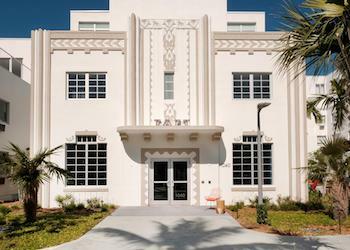 This is a beautiful Art Deco property featured in many travel brochures along with the neighboring low-rise hotels all following on that original pastel palette characteristic of Art Deco designs in South Beach. The historical properties built in the 1930s have been beautifully revamped. McAlpin and Ocean Plaza are two separate buildings, both managed by the Hilton Vacations brand and together offer 52 one or two-bedroom suites. Suites are spacious and comfortable, offering HDTVs and a fully-equipped kitchen including refrigerator, two-burner cook top, microwave, dishwasher, coffeemaker. 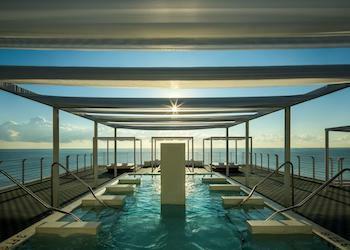 Both McAlpin and Ocean Plaza offer a rooftop terrace with whirlpool spas, a great area to unwind with stunning views of the ocean or to watch comfortably from your lounge chair the helter-skelter frenzy of Ocean Drive pass by just below. There is also a fitness center, a business center and complimentary washer/dryers for guest use. There is no restaurant on premises but Room Service is supplied by a neighboring establishment and don't forget you have a great selection of restaurants, cafes and bars right at your doorstep and a fully-equiped kitchen to prepare quick bites and keep cold drinks at hand! ›› McAlpin - Ocean Plaza is a member of Hilton Honors, redeem/earn reward nights! Just behind Ocean Drive, The Shepley relives the glamour of the 1930s-era art deco style at this small two-story boutique property. In 1938, renowned New York architect Henry Hohauser delivered one of his most acclaimed Art Deco jewels. 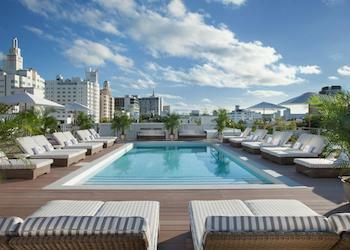 Located in the heart of the South Beach vibe and filled with signature features of the era, The Shepley was born. 75 years later, Argentina-born designer Pablo Chiappori, brings back to life the exciting vintage look of this unique and intimate boutique hotel with natural colors, neon lights and streamlined elements. Its interior is not to be missed, adorned with crystal chandeliers and the butter soft textures of velvet and hardwood, the ambience of this boutique hotel is truly charming. Helpful staff, top location and stylish decor add up to a delightful while affordable boutique hotel experience. 29 vintage designed rooms with all the comforts and modern amenities featuring refrigerators and flat-screen televisions. For a quieter stay request a room facing the back or side, rooms facing the street tend to be noisier. Four minute walk to the beach. Beach chairs and towels are complimentary. 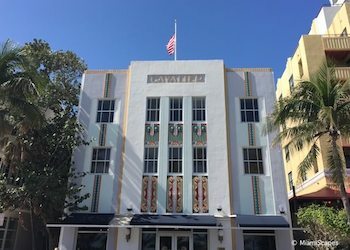 Designed by architect Roy F. France in 1936 as a masterpiece of the Art Deco movement, The Cavalier Hotel maintains its original exterior façade of bright pastel colors in an Art Deco design. The elevator is still the original elevator since the hotels was first built. 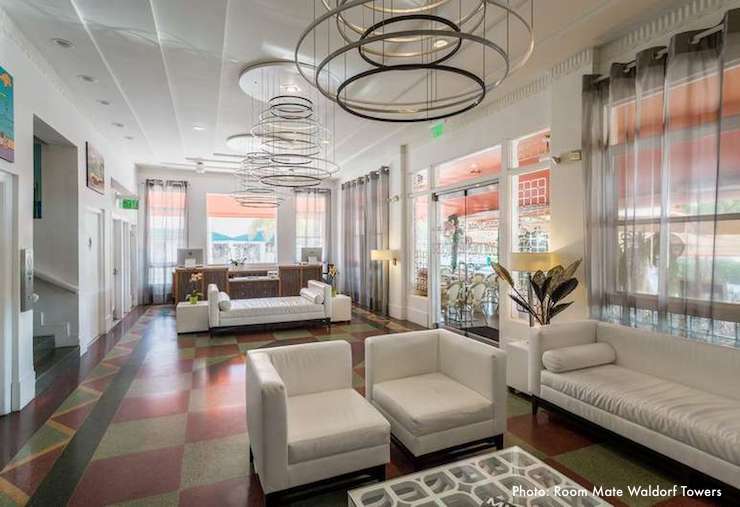 This is a small property with only 46 non-smoking rooms spread over three floors offering a unique boutique hotel experience, some facing Ocean Drive have gorgeous views of Lummus Park and the ocean. There is no restaurant in the premises but certainly more than enough options around. No other amenities, no swimming pool, lounge, gym, etc. This well-preserved gem from the 1930s is adorned in the rich colors, shapes and textures that celebrate the jewel motif of the original Tiffany Hotel. Quietly tucked away between Ocean Drive and Collins Avenue, the vibe here is laid-back and unpretentious even though the beach and party zone are less than a block away. 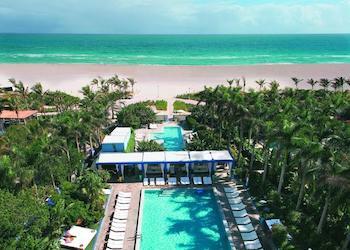 The Hotel of South Beach encompasses 73 spacious deluxe rooms and suites, each with the distinctive Todd Oldham touch. From airbrushed tiles to mosaic door pulls, almost everything was designed and handmade exclusively for the hotel. Latest technology furnishings include flat-screen TVs and iHome docking stations. Four dining options include the Rooftop Pool Bar, al fresco The Garden, the Lobby Bar offering cocktails and bites, and The Hotel Restaurant offering breakfast, lunch and dinner. Built between 1940 and 1952, this hotel underwent a total makeover in 2013 and is now the perfect blend of old and new with its art deco styling combined with ultra-modern amenities. Formerly known as the Hotel Milejan, is a collection of four buildings all classified by the Historical Preservation Board, surrounding a charming central courtyard with an outdoor pool and bar and bistro. This is a small Art Deco Boutique hotel, also in the heart of the action, next to Mango's Tropical Cafe, which will keep things lively to say the least... The Waldorf Towers Hotel is a building designed by the architect Albert Anis in the year 1937. The central part of the main facade on Ocean Drive stands out for its chequerboard style with coloured groves and the original lighthouse-like tower with transparent glass blocks in the corner. 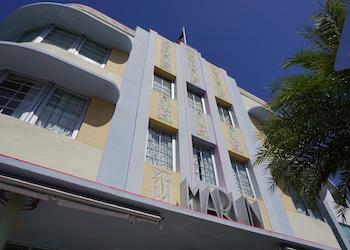 It offers 44 rooms arranged over 3 floors beautifully designed in classic art deco with modern touches. Staff is welcoming and accommodating. No other amenities, no swimming pool, lounge, terrace, etc. 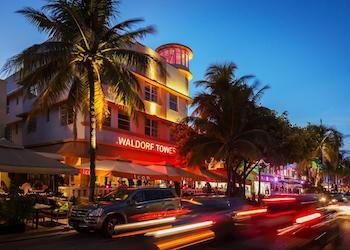 The Room Mate Waldorf Towers also manages a nearby property on Ocean Drive, the Room Mate Lord Balfour, a small Designer hotel in the much quieter neighborhood South of Fifth for a more relaxing stay. Recently renovated, the Plymouth's exterior, including its corner pylon inspired by the "World of Tomorrow" exhibition (as seen at Epcot) at the 1939 New York World's Fair, remains untouched. Many elements in the interior have been retained as well, including the lobby murals by Russian artist Roman Chatov, which color scheme of blues, reds and greens permeates throughout the entire redesigned hotel by Fernando Santangelo. 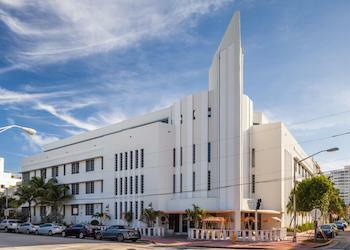 The location further away from the melee of South Beach is actually in the midst of the re-emerging Collins cultural district, the hotel is right next to the Bass Museum of Art and the beach is a mere five minute walk away. It offers 109 rooms arranged over four floors. Rooms are equiped with LED TVs, ipod docks, and coffee-making facilities. Excellent food options inhouse including The Plymouth Cafe and Chefs Bruce and Eric Bromberg's Blue Ribbon Sushi Bar & Grill, located off the hotel lobby, with indoor and outdoor poolside dining. 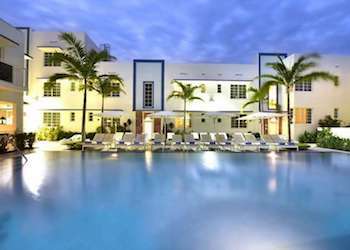 One of the finest examples of Art Deco luxury on Miami Beach, the hotel combines its vintage 1930s roots with a contemporary spirit that runs through the whole property. The hotel has been sensitively restored, with its lavish interiors by Italian designer Paola Navone striking the perfect balance between playful nostalgia and sophisticated modernity. Located just bordering the northern end of what we consider South Beach and closer to refined Mid-Beach, it is close enough to the action on Ocean Drive, literally steps from Lincoln Road Mall and with direct beach access. 74 rooms and suites arranged over 8 floors, many with ocean views and balconies. The Crescent: This is a top property in a top location on Ocean Drive but at the moment the Crescent's facade is undergoing renovation. The hotel IS open for guests during the refurbishment, just be aware of any inconvenience this may entail. Work is expected to end by January 2019. Check availability and rates for the Crescent. The Raleigh: For generations, guests the world-over have been attracted to the hotel's singular style, seductive intimacy AND iconic pool. The Raleigh is currently closed for renovation.